Precision CNC machined from billet aluminum. 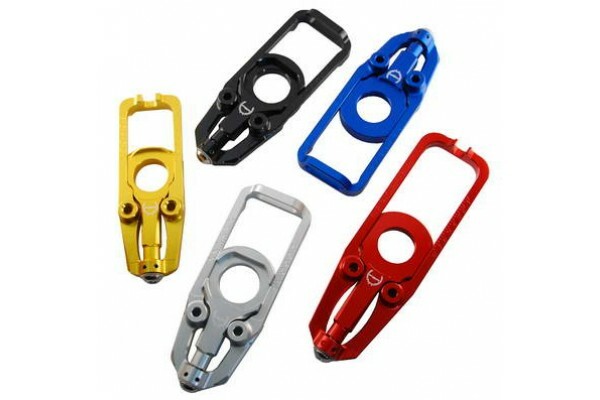 Offers quick and accurate chain adjustment. Anodized in Silver, Black, Gold, Red, Blue. Optional forks for use with rear stand completes that trick look, sold separately. California Prop 65 Warnings: Cancer and Reproductive Harm - www.P65Warnings.ca.gov. This product should not be used in any application other than specified herein. Incorrect application could result in serious bodily injury or death, a crash and equipment damage. This product should be installed by certified mechanic or qualified technician. If unsure of product application, do not install! Please contact your dealer or PSR immediately. Product pictures are used for illustration purpose only, actual product may vary. We believe the contents and specifications of our website are correct. We assume no liability for any errors in listings, specifications, part numbers, prices or model applications. We reserve the right to change specifications, product descriptions, product quality, pricing and application at any time without notice and without further obligation.